Your furnace and air conditioning unit are designed to be quite sturdy, but they aren’t designed to run forever. Their biggest enemy? Dirt and dust. Both your air conditioner and your furnace (along with your blower) are in the business of changing the temperature of air and moving this air throughout your home. With that much air, it’s unsurprising that dust and grime begin to build up over time. The more dust and grime you have, the harder your air conditioner, furnace, and blower will have to work to do their job. Too much dirt and they’ll stop working. 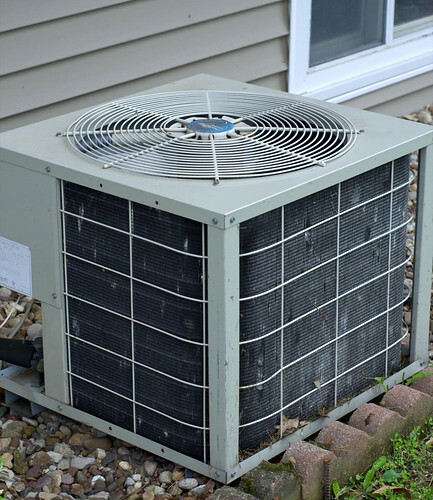 In other words, if you want your air conditioner and furnace to run for a long time, you need to do a little bit of maintenance work on them. Take a look at that air conditioner. Some of the coils are blocked with gunk. It’s simply not running as efficiently as it should, which means the unit has to work harder to cool the home. If it’s overworked, it’s also more likely to break down. How can you fix that? Cleaning your external air conditioning unit is actually pretty easy. Just stop by your local HVAC supply shop and buy some cleaning solution (one jug of it will be enough for quite a few cleanings). Go home, cut the power to your AC unit using the breaker box, then wet down the coils on your unit with a garden hose. Using gloves and safety glasses, spray on some of the cleaning solution, let it sit for a while, then spray the coils down again with a garden hose to wash away both the grime and the cleaning solution. Wait a bit longer, then flip the power back on. It’ll look like new and run more efficiently, too. What other steps can you take? Make sure you change the filter in your blower on a regular basis. Go down to your basement (or wherever your blower is located) and check the filter in your blower unit. If you’re not sure when you last changed it, it’s probably time to change it. Mark down the size of your filter, then head to your local hardware store and pick up a replacement filter. Swapping the filter is easy, but the important step is to note the lifetime of your new filter and mark on your calendar when you need to change the filter. If you’re feeling adventurous, you can clean the blower as well. The blower is a giant fan usually found next to the filter. Turn off the breaker and remove the cover on the blower unit. Most of the time, these just unplug like a normal fan. Unplug it, then use a brush to clean off the blades and a vacuum cleaner to clean the area around the blower unit. Plug it back in, put it back in place, put the cover back on, and flip the breaker again. You’ll have more efficient air flow, which means a lower energy bill. There are other regular maintenance steps well worth taking for your furnace and air conditioner, but they usually require additional equipment (like a high-powered vacuum) and can cause damage if done incorrectly, so you’re better off having an expert handle them. The end result of these tasks is a more efficient heating and cooling system in your home. It will run less, which means a smaller energy bill for you, and it also extends the life of your air conditioner, furnace, and blower system, meaning you save long-term on replacement costs.